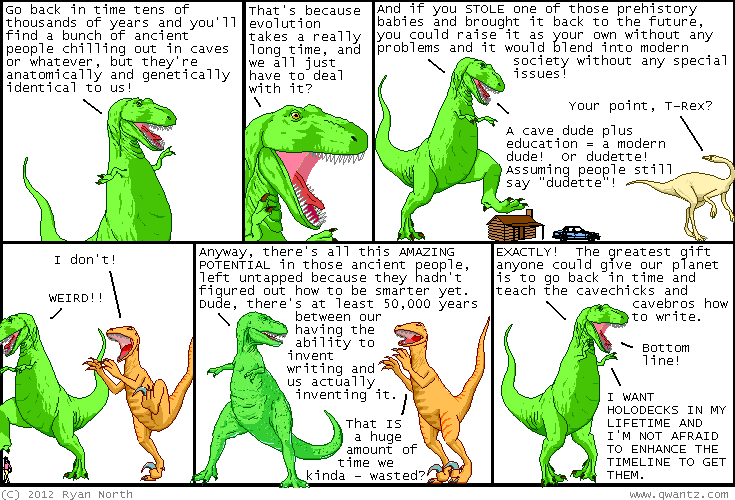 Dinosaur Comics - March 27th, 2012 - awesome fun times! –Oil is totally a renewable resource! March 27th, 2012: Surprise! I'll be at the Emerald City Comic Con in Seattle this weekend! It actually goes from Friday to Sunday so that is plenty of time to MEET and HIGH FIVE and maybe FACILITATE TRANSACTIONS FOR AWESOME THINGS. I'll be splitting my time between the Boom booth (Adventure Time!) and the TopatoCo booth (Dinosaur Comics!) - Boom will have the comics for you, and TopatoCo will have everything else! One year ago today: did you see what i did there with Machine of Death? I BELIEVE THAT IS CALLED "SYNERGY"